Masala muri chivda is one of my most favorite evening time snacks. It can be eaten any time, but I prefer it with a hot cup of tea. It takes very less oil. It tastes mildly as well as spicy also.It can be stored for two to three weeks. Kids also like it very much. Weekend coming means I need to prepare something like this and store it in a container. I have learned it from my childhood friend before marriage only. After marriage, first time when I made it my MIL also liked it very much though she doesn't like garlic. In the process of learning new varieties, I stopped making this frequently. As I started recollecting my old memories and compiling them in this blog, it also came up. 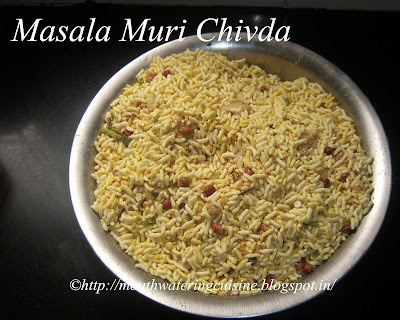 The masalas mixed in this it gives a new kind of flavor. I don't say a very simple because it is not. We need to roast them separately and make powder of them. We get two varieties of puffed rice. One is machine made and the other one is made in very hot sand. I prefer machine made only for several reasons. So, today I am going to give you the recipe of it. Dry roast ground nuts till the aroma come out. Keep aside. Dry roast chana dal and keep it separately. Dry roast til or sesame seeds and keep it aside. Roast dry coconut. Keep it aside. Heat oil in a kadai, add turmeric powder and murmura and mix well, so that murmura turn yellowish color. Fry them till they turn crispy. Heat oil in the same kadai, add slit green chillies and curry leaves. Fry them till the chillies turn crispy. Transfer this to a wide plate and add all the rest of the ingredients and mix well. Blend half portion of roasted ground nuts, chana dal and sesame seeds into coarse powders. 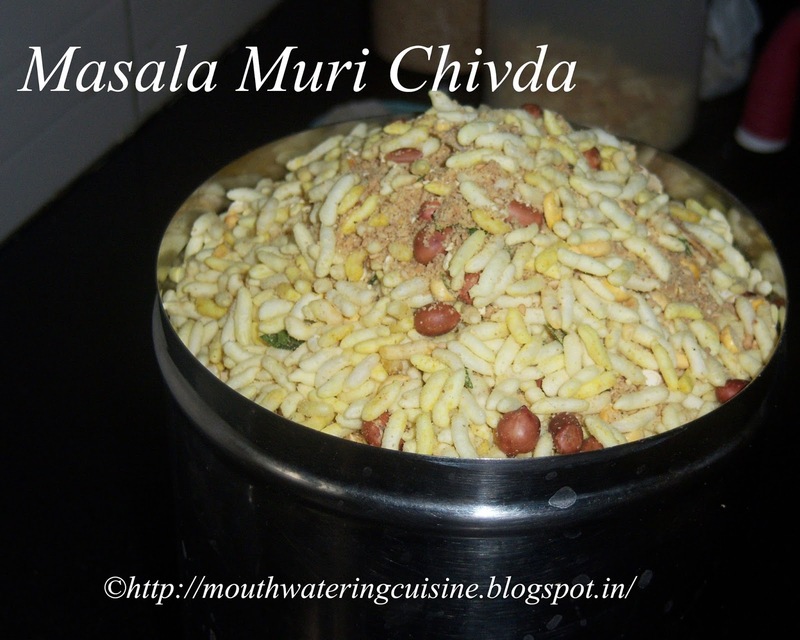 Blend each of them separately and add them to murmura. Lastly just before adding all the powders, blend garlic along with them and add this to murmura. The main draw back with it is that these powders settles in the bottom of the container. So whenever serving it mix them properly and serve.